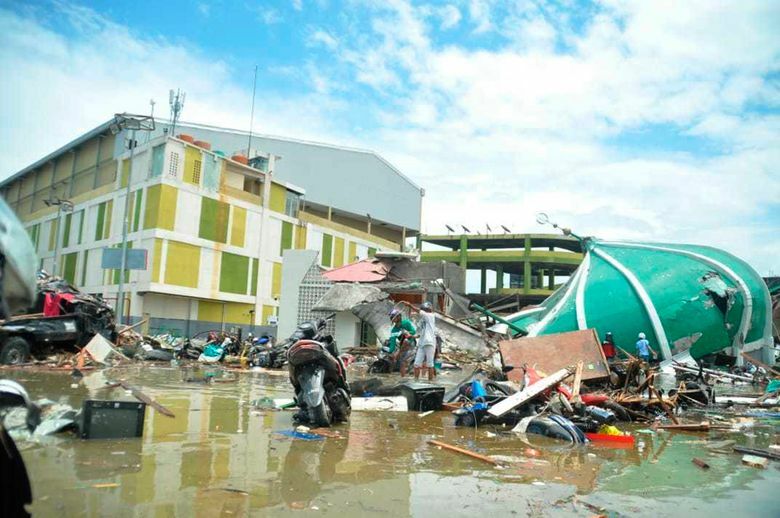 MAKASSAR, Indonesia (AP) — An early warning system that might have prevented some deaths in the tsunami that hit an Indonesian island on Friday has been stalled in the testing phase for years. It is too late for central Sulawesi, where walls of water up to 6 meters (20 feet) high and a magnitude 7.5 earthquake killed at least 832 people in the cities of Palu and Donggala, tragically highlighting the weaknesses of the existing warning system and low public awareness about how to respond to warnings. When the 7.5 quake hit just after 6 p.m. Friday, the meteorology and geophysics agency issued a tsunami alert, warning of potential for waves of 0.5 to 3 meters (2 to 10 feet). It ended the warning at 6:36 p.m. That drew harsh online criticism, but the agency’s head said the warning was lifted after the tsunami hit. It’s unclear exactly what time tsunami waves rushed into the narrow bay that Palu is built around. Experts say the prototype system deployed offshore from Padang — a city extremely vulnerable to tsunamis because it faces a major undersea fault overdue for a massive quake — can provide authoritative information about a tsunami threat within 1 to 3 minutes. That compares with 5 to 45 minutes from the now defunct buoys and the limited information provided by tidal gauges. The system’s undersea seismometers and pressure sensors send data-laden sound waves to warm surface waters. From there they refract back into the depths, traveling 20 to 30 kilometers (12 to 20 miles) to the next node in the network and so on. The Padang network’s final undersea point needs just a few more kilometers of fiber optic cable to connect it to a station on an offshore island where the cascades of data would be transmitted by satellite to the geophysics agency, which issues tsunami warnings, and to disaster officials. Associated Press writer Margie Mason in Jakarta, Indonesia, contributed to this report.